1) Fill the pool to the middle of the skimmer (pool tile). 2) Shut off equipment (ie: pool pump) and keep off for 24 hours. Note: if you have a pool and spa combo we recommend that you isolate the spa if possible. Please keep everyone including animals out of the pool and spa during the test period. 3) Take a bucket and mark the inside of the bucket with a marker about three inches down from the rim of the bucket. 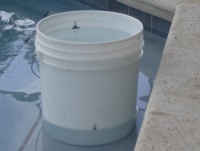 Fill the bucket to that mark and set it on the first step of the pool. Wait for the water to settle down ( you will make waves when you set the bucket) then take a pencil and mark the water level of the pool on the outside of the bucket. 4) After 24 hours compare the two levels. If the pool or spa water levels go down more than the water in the bucket, then you most likely have a leak. If during the test period it rains, the bucket will become a rain gauge. If the water level in the bucket goes up, the pool water will do the same.